Greying hair is a growing concern as we age. How do we stop grey hair and hair loss in Singapore? While dyeing our hair might be a relatively quick fix, it is but a temporary solution and moreover, might add further damage to hair follicles, accelerating the greying process. To tackle this common woe, Follicle Hair Singapore has developed a revolutionary treatment, Grey Hair Defy, that not only reverses the signs of greying, but boosts hair growth and strength. Why hair loss? Why does hair turn grey? Before solving the greying problem, we must first understand the root cause of grey strands. Each hair follicle contains a certain number of pigmentation cells. These cells constantly produce a chemical called melanin that lends the growing shaft of hair its colour. Melanin is the same chemical that makes our skin’s color fair or darker. The darkness of one’s hair colour also depends on how much melanin found in our tresses. As we get older, the pigment cells in our hair follicles gradually die. When there are fewer pigment cells in a hair follicle, that strand of hair will no longer contain as much melanin and will become a more transparent color — like gray, silver, or white — as it grows. As people continue to get older, fewer pigment cells will be around to produce melanin. Eventually, the hair will look completely grey or white. 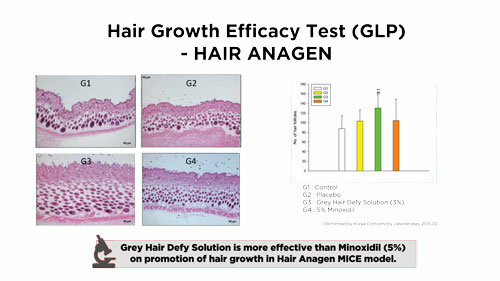 Grey Hair Defy is a patented formulation that contains Botanical Stem Cells harvested using biotechnology. 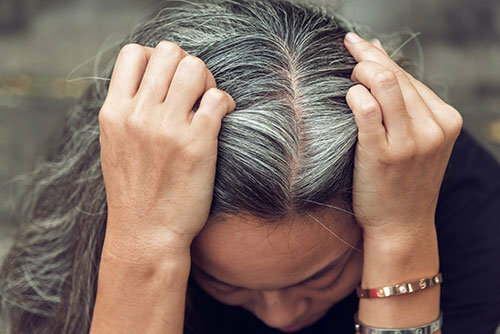 When studied in comparison with other US FDA approved hair growth medications, Korea Food and Drug Administration (KFDA) found that the cytokine formulation found in Grey Hair Defy boosts the anagen phase of hair growth and suppresses the telogen phase, which is the stage when hair is released and falls out. This means that the formulation is proven to increase Melanin production and hence give a natural hair darkening effect. The key to this treatment is the patented formulation that not only contains stem cells harvested by biotechnology, it also contains 150 active ingredients such as antioxidants, essential vitamins and amino acids. Other than the fact that it is completely safe with no side effects, bio-enzymes and fermented proteins help reduce and control inflammation and improve blood circulation. Aside from hair health, scalp health is also vital in aiding the process. 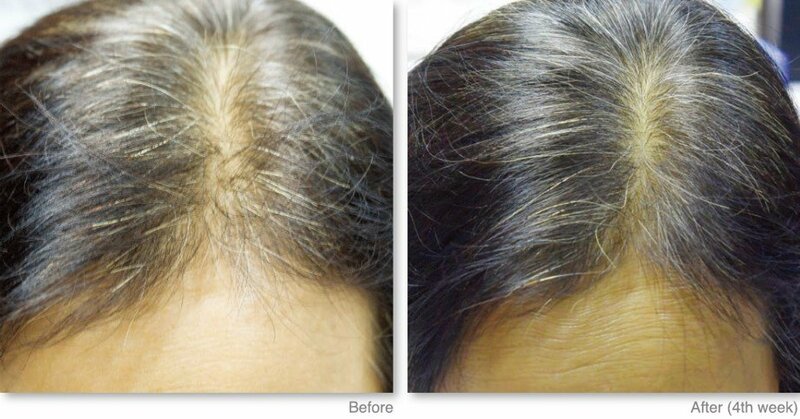 Grey Hair Defy uses medical-grade RF Hair technology to deliver the solution effectively into the scalp. This state of the art device is the first in the world to harness radio frequency energy for the delivery of the formulation into the scalp. All this means that Grey Hair Defy not only helps in bringing the black back into your hair using the most natural way possible, it also helps strengthen hair root and hair sheaths. The inflammation control and improvement of blood circulation also ensures a healthy nutrition supply and helps prevent blood vessel narrowing. 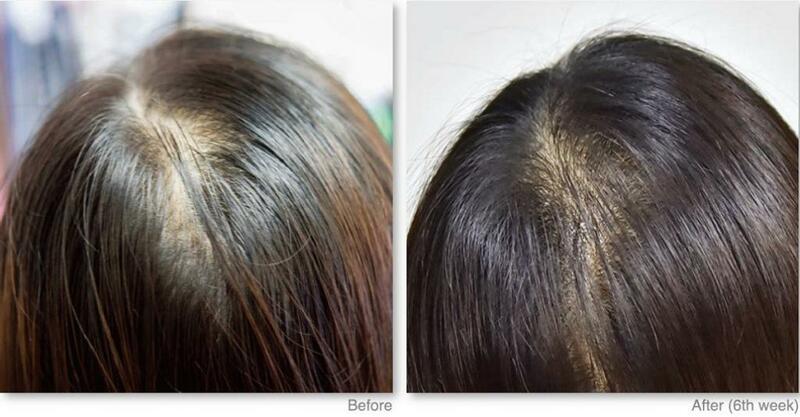 Last but not least, Grey Hair Defy also eliminates scalp residues, thereby restoring hair cuticle damage. The facts are as clear as black and white: there is no better way to infuse colour back into your hair than with Follicle Hair Singapore’s Grey Hair Defy. Not only is it free from paraben, silicone or artificial fragrances, it combines the most organic ingredients and the best cutting-edge technology and research to produce a long-lasting result. 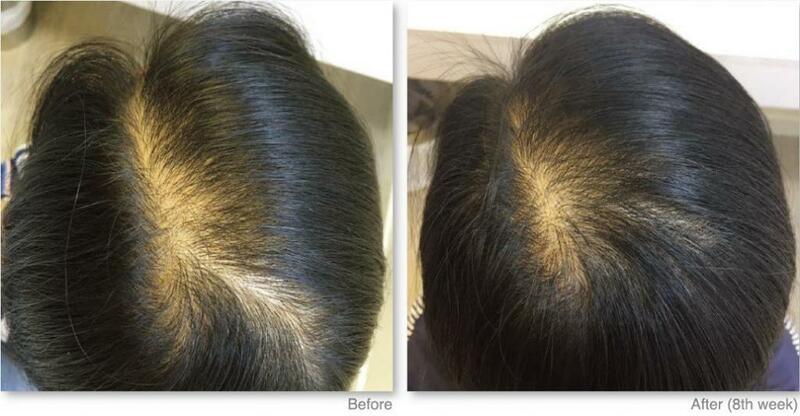 Follicle Hair is having a first-time trial offers now, so contact them to find out more!